Rain mercifully cut short the Mets’ time in Atlanta, saving our ears and our sanity from any more Tomahawk Chops until [checks schedule] ugh, late May. Instead, the team headed off to St. Louis to face the less-auditory-but-still-rage-inducing Cardinals with Luke Weaver on the mound. Zack Wheeler took the hill for the Mets, and we all waited with baited breath (well, as baited as it can be for game 21 of the season) to see if we got more of Game 1 Wheeler in Miami or Game 2 Wheeler against the Nationals. It was more of Game 2, and if you’re a fan of well-pitched ball games, this was not a good night for you. Wheeler gave up two runs in the first and two more in the fourth, needing 83 pitches to get even that far. He induced only three swinging strikes (that’s bad), allowed six hits, walked two and struck out three. The Cardinals weren’t fooled by anything, hitting seven balls with an exit velocity over 100. Wheeler was lucky he didn’t put the Mets in an even bigger hole. Of course, Luke Weaver wasn’t much better. Some poor defense hurt him early on (Jay Bruce tripled, that should tell you all you need), but he had a 4-1 lead with two outs and nobody on in the fifth inning. Sixteen of his next 17 pitches were out of the strike zone, the only exception being a grooved fastball that Yoenis Cespedes vaporized for a game-tying, three-run home run. The ball left Cespedes’ bat at more than 115 mph and traveled an estimated 463 feet, just to the right of Big Mac Land. With the game tied and Wheeler out of the game, the Mets’ turned to Matt Harvey for his first relief appearance. It was much the same from Harvey, who flashed a plus slider or two and surrounded it with 35 pitches of not much else. He struck out two and allowed one run in two innings of work on a pair of doubles, and the Mets took a 5-4 deficit into the seventh. Paul Sewald came in next and continued to excel in a multi-inning role. He allowed just one hit in two innings of work, striking out one and needing only an efficient 25 pitches. 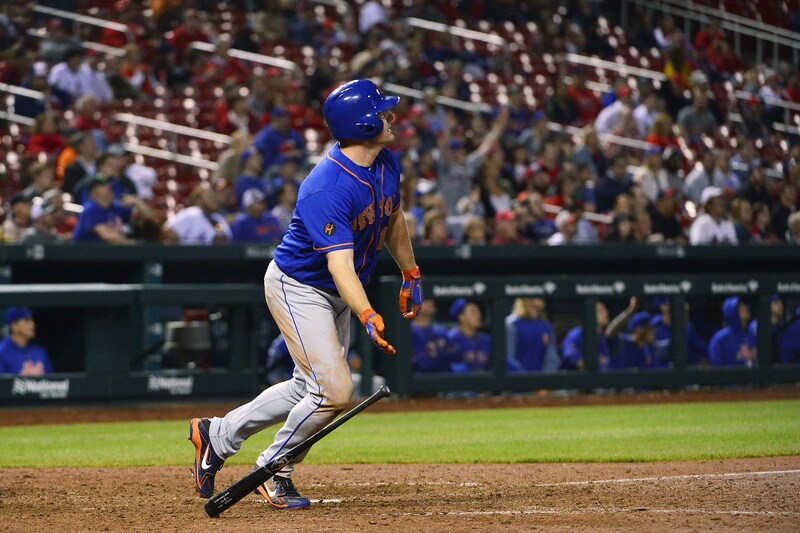 The Mets offense backed him up in the top of the eighth, with Todd Frazier and Jay Bruce walking and singling to start the inning and put runners on the corners. Adrian Gonzalez followed with a sacrifice fly to left, and the game was tied at five. Robert Gsellman pitched the ninth, and immediately it looked like we were heading for another very Metsian loss when the first two Cardinals reached. Instead, Gsellman struck out blossoming Met-killer Jose Martinez, then induced a double play to force extras. Bruce followed that up with a solo home run in the top of the 10th to put the Mets up, and Jeurys Familia slammed the door with a dominant inning of work to give the Mets their 15th win of the season. This game was much closer to the blueprint the Mets’ drew up for their offense this offseason; Cespedes and Bruce hit dingers, and the pitching staff kept things close enough for the win. It’s good to see those two get going (Bruce finished a double short of the cycle) given their early season struggles. Even Michael Conforto showed some encouraging signs, drawing three walks, though it still feels like he hasn’t squared a ball up in weeks. Yesterday was the first time since June 19, 2013 that Matt Harvey and Zack Wheeler pitched on the same day. Back then, Harvey was still the Dark Knight and Wheeler was the next in a wave of pitching prospects that were supposed to carry the Mets back to the promised land. A lot has changed since ‘Super Tuesday’ though; Harvey is a shell of his former self, destroyed by TOS and vilified by the city that once chanted “Harvey’s better,” while Wheeler is as maddeningly inconsistent as ever with stuff that’s a couple degrees less impressive. Baseball will always find a way to break your heart. On that note, the hullabaloo about Matt Harvey not talking to the media is absurd, insulting and patently ridiculous. Why not talk to Zack Wheeler, who was worse than Harvey, or to any of the other Mets pitchers who turned in quality performances? It’s playing to the lowest common denominator, the sort of fan who enjoys calling into WFAN and calling a player they’ve never met in person lazy or entitled because he’s not performing. Jason Vargas has been confirmed to make his debut in San Diego on Saturday. He joined the team in St. Louis and will hopefully offer a stabilizing, albeit unspectacular presence in the back of the Mets rotation. The Columbia Fireflies played a doubleheader yesterday and got swept, but that’s not really news. Several Fireflies are making news with their standout performances, however. Chris Viall struck out twelve in 5.1 innings after striking out 11 in his previous start and now has a 29:8 K:BB ratio through 14.1 innings. Stephen Villines has been even better, as his three-strikeout, 1.1 inning relief appearance gives him a 17:2 K:BB ratio through 11.2 innings. Villines needs a promotion to Double-A immediately, and probably deserves a shot in the major league bullpen before too long. Finally, Jeremy Vasquez extended his franchise-record on-base streak to 18 games with hits in both ends of the doubleheader. He’s not really a prospect, but it’s a fun bit of success for a relatively unknown player.